Some of you may have already heard...but if not, these were just released on Friday. You already know how much I love these Stains and now 12 more...all the seasonal colors. Lucky Me, a box of all 12 were delivered to my house on Saturday. I have only scratched the surface of the new colors...I can't wait to try the two on the left, picked raspberry and festive berries. I decided to do a seasonal project using 3 of the new stains and the Tattered Leaves die that Deb used to make her spectacular arrangement in the last post. I picked ripe persimmon, iced spruce and squeezed lemonade. Before I get to the stains, I cut a few pieces of Sticky Back canvas in natural, the size of the leaf I wanted to die cut (about 2 x 4"). I squeezed a bit of each color onto the craft sheet. Then spritzed the surface with water from a mini mister. Then just started swiping the Sticky Back Canvas through the stains. Gosh, I love the bright colors and the Iced Spruce is perfect to keep the brights from overwhelming. Once dry I cut the same leaf pattern in each. Love how random the colors are and the texture of the Sticky Back Canvas is great. I picked up three of these dishtowel sets at Target to use as napkins on Thanksgiving. I believe it was $3.99 for four, two of each pattern. The towels are not large, just 14 x 14" so good for a napkin. I peeled the backing off of the leaf and stuck it to the dishtowel. I stitched the leaf starting at the top of the stem and sewing to the bottom, then put it in reverse to get back to the top. 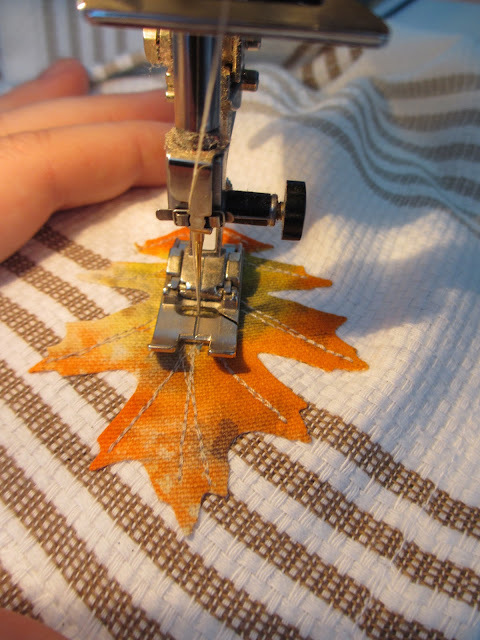 From there I stitched each part of the leaf, back and forth until I had worked my way to the bottom again. This is how it looks stitched to the towel. I purposefully picked a thread that was a different color than the leaf so the stitching would stick out like the veins in the leaf. Remember, Distress Stains are reactive to water so the most important step is to heat set the leaf. I used a dry iron (no steam) and heat set it for 45 seconds or so...then I probably did it again for good measure. I tested this napkin under running water and rubbed it quite a bit. No color washed out, not even the thread was discolored. I tied the top of the napkin together with Crinkle ribbon dyed with Frayed burlap stain and a Trinket Pin. Then I thought, what if you have napkins already or you don't want something so permanent? 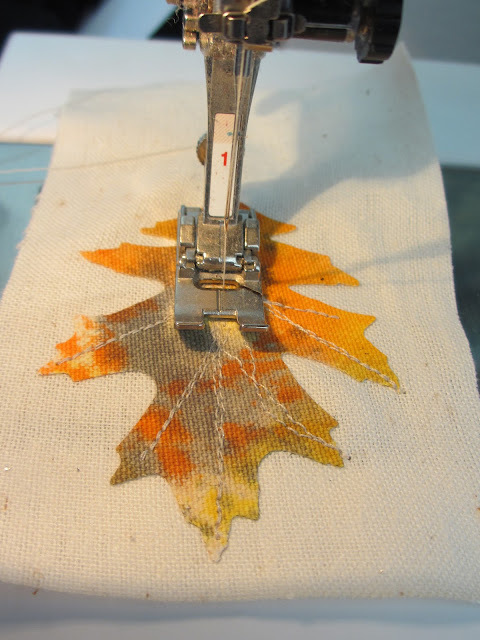 Adhere the leaf to a piece of muslin and stitch the leaf down. No need to be perfect...a little of the muslin showing is good. Just use your fingernail to fray it a bit. Use your paper piercer to make a small hole a the the base of the stem. View of the back side. This time, tie the leaf to a napkin with paper string. I also added a Seasonal muse token. And one more idea for the leaves...a fall card. A great time of year to tell someone how much they mean to you. I used the mini baroque die to cut a piece of old book paper (inked the edges with Vintage Photo Distress ink). I glued it to a District Market Notecard from the Merriment set. I tied the stem of the leaf with a bit of leftover Crinkle ribbon. Then glued the leaf to the card with a bit of glossy accents. Finally, I added the word "simplify" from the chitchat sticker book. Love how that turned out. NOTE: if you wanted to skip the stitching part of this one, just adhere the Sticky Back Canvas leaf directly to the book paper. 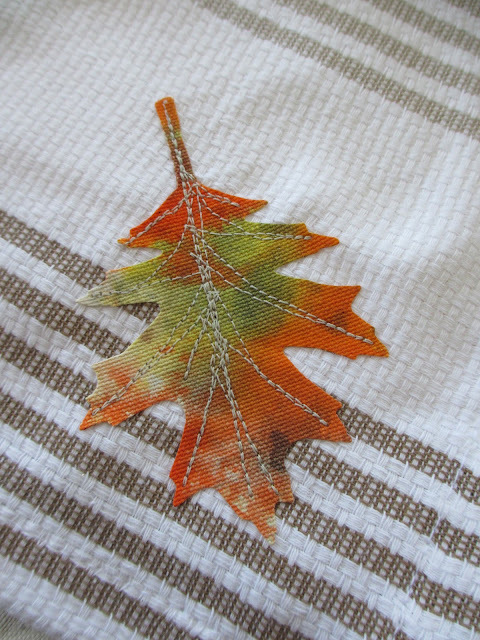 Well, I love how the leaves today turned out and I love the new distress stain colors. Glad that I mixed a dull iced spruce with two very brights like squeezed lemonade and ripe persimmon. Can't wait to experiment more. Be sure to pop by on Thursday for another tutorial using Sticky Back Canvas (and don't tell anyone...a giveaway). Cheers for a good productive week...looking forward to experimenting with more distress stain colors, watching a new episode of Masterpiece Theater Upstairs Downstairs waiting for me on my DVR (such a great series), and a date night to see the new James Bond movie. It's gonna be a good week. Paula, Adorable- I cannot believe how awesome those leaves make the place setting look. You have no fear of mixing colors and I am trying to take that and use it as my inspiration. In return you can have the lace behind the facet idea! Miss you. These are so awesome!! You are just way way creative. Thanks for the tip on bleaching my christmas trees. Now I'm bathing the little wreaths too. Very addictive. Will send picture when I'm all done. Thanks for inspiring us all. Very, very cool leaves! Super card...I tend to forget about that die...gotta get it out. Can't wait to see what's in store next! I love these projects! First of all, Autumn is my favorite time of year, so I don't think I can ever have enough of those gorgeous leaves. Really wonderful ideas Paula. Thank you so much for sharing them and showing us how to make these. These projects are all wonderful ways to use those scrappy things around the house, which is my favorite thing to do. Thanks for such neat ideas. Absolutely fabulous!!!! WOW!!! This is crafting!!! Oh wow, your napkins are absolutely gorgeous, love the great colours, you are so clever! thanks Gabby! Glad you like the blog! These are just wonderful......just love 'a mind that never rests'. Happy Thanksgiving! GREAT Ideas! I want those new colors too! Paula, I don't know what I would do without your tutorials. This one is perfect because I wanted to do a Thanksgiving card and here it is. Now I am dreaming about the giveaway. I would love to have those Distress Stains show up at my door, too. Thanks for all the time you spend taking these photos and creating for us all. Very very nice!! So, I have a question...if you wash the napkin does the ink bleed or is it set into the canvas? Looking forward to the give away! Dorothy, I talked about that very thing in the tutorial. "Distress Stains are reactive to water so the most important step is to heat set the leaf. I used a dry iron (no steam) and heat set it for 45 seconds or so...then I probably did it again for good measure. I tested this napkin under running water and rubbed it quite a bit. No color washed out, not even the thread was discolored"
I did not wash the leaf with detergent, just water. Wonderful ideas and inspiration Paula (and by the way, I LOVE your dishes!). thanks Heidi, the old on the bottom came out of am antique store in TX. And the orange salad plate is from pottery barn. I only have 8 of the vintage plates so I am always on the hunt for more (half the fun). At Thanksgiving, I usually use two similar china patterns on the same table to accommodate all the guests. Does te adhesive on the back of the canvas gum up your sewing machine needle?? Ann, I never have any problem sewing through the sticky back canvas at all...and no gumming the needle up even though you might think it would. Beautiful new colors. 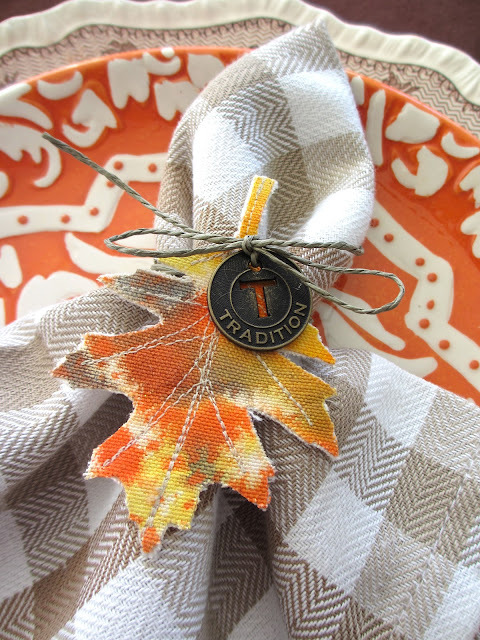 Love your leaves and both ways you used them on napkins. Dang! 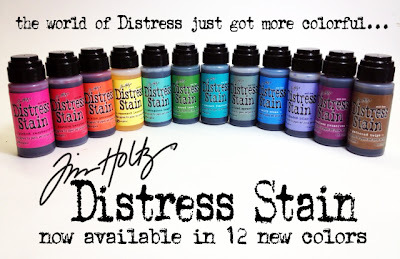 I just ordered some distress stain from joann.com on Friday and they didn't have these colors :( Gotta get my hands on these bright colors. I love sticky back canvas project. Absolutely love everything you posted today. Just gorgeous! BTW your plates are quite stunning as well. Can't wait to see what you two have in store for Christmas. Thanks so much for sharing. Your leaf projects are just wonderful - love everything and thank you for all the steps! Love these projects - how fun!! Can't wait to try some of the new colors! So can I come to your house for T-day??? I love your leaves and the whole place setting is gorgeous!!! Awesome project,great tutorial, those colors are so pretty ! !